At just past 70 years old, Carolyn Mather has run far more miles than any woman in the world ... or at least those tracked by www.100kLifetime Miles--more than 217,000 miles. In fact, there are only a handful of men with more miles than Mather. Her biggest years--well over 7000 miles--have been the last three, which came on the heels of her husband's death. He--Steve Mather--played a big role in distance running also, as he basically invented the science of fluid tables and distribution to elite athletes in the world's biggest, most important marathons. In addition to her high weekly mileage, in December Carolyn Mather (Morganton, GA) won her age group at the 2018 USATF Club XC Championships. She repeated this past weekend at the USATF National XC meet in Tallahassee FL. Your career/profession? I am retired from medical education and health care management. I am a registered nurse and have a PhD in Educational Leadership and Research and Statistics. 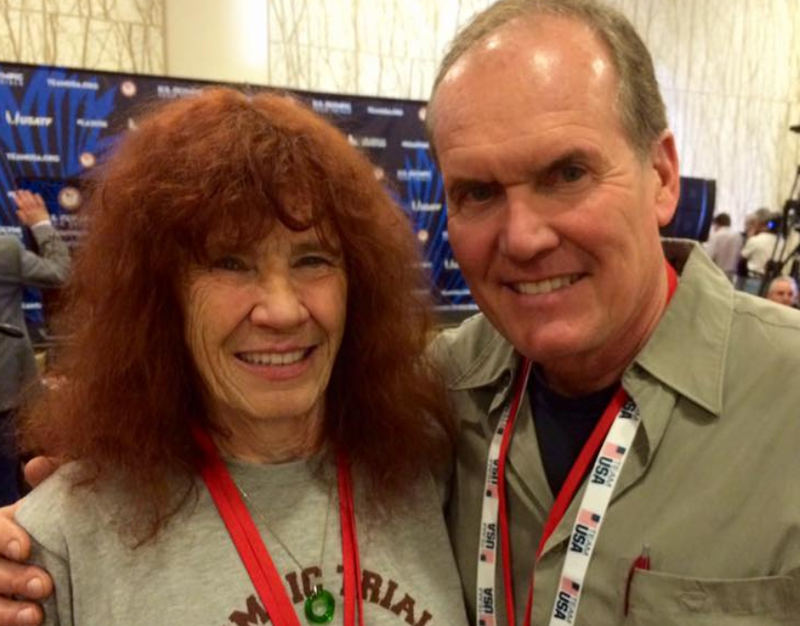 I have taken up a second career in retirement as a writer for Running Journal and Fortius Media/RunBlogRun. When did you start running and why? 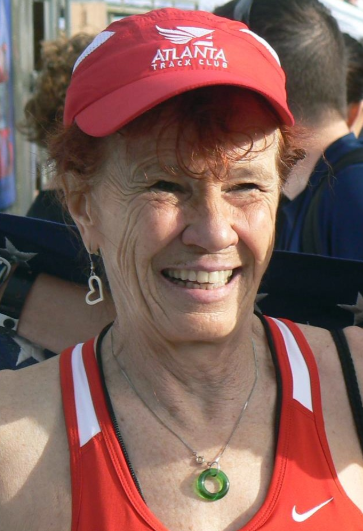 I started running in the summer of 1978 when I was living in the coed dorm at the University of South Florida and finishing my masters degree. After having worked as a full time middle school teacher and coach, part time professor and graduate student,mother, wife and general housekeeper and cook, I was completely at a loss for something to occupy my time. So I started running. week with very few off days. Top performances or achievements? Winning the overall title at the Tampa Bay Marathon (as president of the local running club) for three years. PR of 2:51:40 missing the Olympic marathon qualifying standard by a few seconds (like 24 )in 1984, Developing a program for our Atlanta Track Club Women's competitive team with Dr. Dave Martin to help interested team members qualify for the Olympic trials. Also I won the overall title at four races the year after I turned 65. USATF Club XC Champs, 2018. Any recent race results? 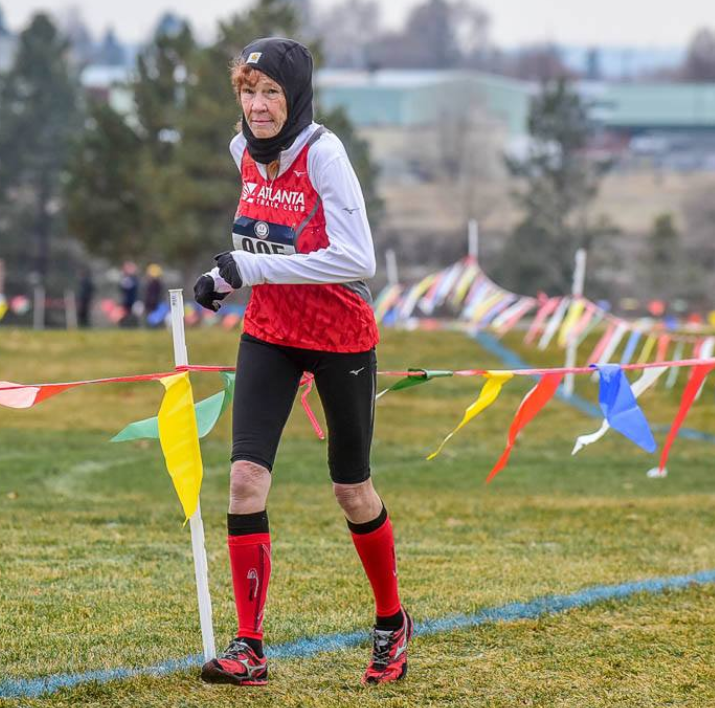 I got a thrill I never expected when I won the 70-74 national cross country title in my only race in 2018 in Spokane, WA, in December. Does getting slower bother you? If you do not get slower as you age, you are on some serious stuff!! Still, I have actually set some "personal records" in age graded running (over 90th %) for several years. Also, the attrition rate once women go through menopause is very high, so if you stay healthy and keep running, you can do well in your age group. I am a very self motivated runner. My husband was my best fan and constantly urged me to run races and train until he passed away in 2015. He was a great motivator, and that continues as I run "with him" every day, which has kept me going and kept me sane. No matter what, getting older and staying healthy beats the alternative!! How have your diet and weight changed? Any particular nutrition habits? When I started running I weighed barely 90 pounds. Running gave me more muscle and a heartier appetite, and I got up to 113. (I weighed 120 in hIgh school and I am 5"7' tall). My diet is pretty much the same. I have tried various changes, but I eat healthy and enjoy chocolate. I take iron, vitamin D3,cranberry, turmeric, and calcium with magnesium. I manage to stay at or near 110 pounds now. What injuries or other health issues have you faced through the years? How have you dealt with these? I have had two fractures-a stress fracture in my early years in my lower leg caused by racing a 10K twice then doing cross country the next day. The other fracture was caused by my grand daughter putting her step stool on my foot then stepping on it. I ran with that break (actually a stress reaction) for nearly four months until it broke through. Both injuries healed completely thanks to great running doctors, and I did all my mileage in the pool while injured and while we lived on a sailboat. I have become very creative in my training. How would you describe your philosophy of life, running, and aging? Running has saved my life the past few years since my husband died. Running has always been a time for me to refresh myself mentally. I wrote my PhD thesis while running and truly enjoy training and hate racing. Racing for me is a social event and I just happen to have a little talent. My chosen daughter, Colleen DeReuck, used to tell me that when the going gets tough in a race, you power through the pain to the other side. My response was if you back off, you feel much better. And I must say I have truly only raced hard twice in my entire career and won both races. What 3 short tips would you offer to those wishing to achieve lifetime running? 1--Do not run if you do not enjoy running. Do it for yourself. If you hate it, do something else. 2--Do not run with music. Listen to your body and take in the beauty around you. Connect with the earth and learn to appreciate that you have the ability to run. 3--Learn that the most difficult part of a run is getting on your shoes and out the door. You will always feel better if you do. How does running & fitness help you on a daily/weekly basis? It is a part of every day and a part of my ongoing routine. There is always time for running. And I must admit I have more energy than almost anyone of every age I know. I attribute that to my continued relationship with running and fitness. Please provide a favorite quote or several. What are the biggest lessons (life lessons and running lessons) you have learned from running? It is all about the journey. You will have ups and downs, good days and bad days along the path. But you will become stronger and more resilient, and you will meet amazing people. It is not about times (unless you are doing it for a living), it is about proceeding forward on the road.